Many of the most thoughtful people writing about education these days are taking time to focus this week on the reasons we support unions, through the EduSolidarity event. I support my union, the National Education Association, and I want to share my thoughts about the role I hope it, and the American Federation of Teachers as well, will play in meeting the challenges we face. In ordinary times teachers unions play a valuable role in allowing us to elect people to represent our collective interests, and negotiate on our behalf. We have contracts that provide the rules that govern our work, and help create good conditions for teaching and learning. The union helps make sure our rights are protected if there are disagreements over these things. These are all worthwhile. But in these unprecedented times we need our unions for a much bigger task. 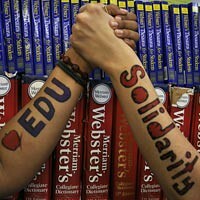 We need our unions to help save the institution of public education in America. This is a very tall order, and one that our unions have not had to fulfill for a long time. How are we going to do it? We can only succeed if we are able to accomplish several difficult things at the same time. With the help of our unions, we must push forward a different narrative than the one currently being promoted as "school reform." The source of the achievement gap is not bad teachers, nor even our admittedly flawed education system. The greatest source for inequality of outcomes within schools is the great inequities outside of schools. Until the wealthy stop making excuses for the ever-increasing number of children living in poverty, our schools can only have a marginal impact. Remember, every time you hear it said that "teachers are the largest in-school factor affecting student achievement," that this influence only accounts for about 20% of the total variation, and is dwarfed by out-of-school factors, such as family income and education level. The Achilles heel of our public schools is their lack of success with our most vulnerable students, those who are growing up in poverty and violence. But what should be an indictment of society has become instead an attack on the schools themselves, and those of us who work in them. How can we turn this around? We must take a hard look at what NCLB has done to these schools in the name of "education reform." A recent report from FAIRTest and several leading civil rights organizations takes on this task. Federal Policy, ESEA Reauthorization, and the School-to-Prison Pipeline is available here. It points out how NCLB's test and punish regime is leading schools attended by poor students to focus on narrow test preparation, which in turn intensifies student alienation. This then leads students to drop out, or pose greater discipline problems, for which the schools are increasingly resorting to police intervention. Thus, there are direct and indirect connections between our schools and the high number of our children who wind up incarcerated as young adults. NCLB, supposedly created to help the children living in poverty, has driven our schools to adopt policies and practices that are destroying lives. Our unions have a role to play here, but they are not yet truly leading. Karl Rove's brainchild, and the centerpiece of the Bush domestic agenda, the No Child Left Behind Act, was a devastating blow to the alliance that advocated for public education, as it put in place the mechanism by which teachers and public schools could be indicted for societal failures. Our unions have tended to focus on aspects related to bargaining, and have failed to mount a decisive, principled challenge to NCLB. Even now, as Duncan and Obama seek to revise the law in ways to continue to exert maximum pressure on schools in poverty, while releasing more affluent schools from the "failing school" label, some union leadership joins in press opportunities with Secretary Duncan pledging union collaboration in the "school turnaround" efforts. But as Sabrina Stevens-Shupe lays out here, the turnaround models the Department of Education is pursuing are a huge part of the problem, since they build a pathology of failure. We must embrace a different approach that builds on the strengths of a school. Solidarity is the bedrock principle of a union. We stand together, and defend the vulnerable. Students at low-performing schools have taken the worst blows from NCLB, and only now, when 80% of the schools will be labeled failures, do we hear Duncan and Obama insisting the law must be changed. But they intend to continue to label and punish the schools of the poor. Where will our unions stand on this crucial issue? Will we accept or even support versions of NCLB that let most schools off the hook, but keep the test and punish pressure on the underdogs in the "bottom 10%"? It has been inspiring to see the teachers and other public workers in Wisconsin who have been fighting for collective bargaining rights. In the long run, we need to make sure that as teachers, we are also fighting for the interests of our students, and articulating a clear vision for the schools of the future, for schools that bring creativity and imagination back to those currently turned off by test preparation drudgery. We do indeed have better answers than the ones coming from the Department of Education, and we have been developing them further as part of the organizing we have been doing for the Save Our Schools March this summer in Washington, DC. Many of our local unions - such as my own, the Oakland Education Association, are joining in this effort. This is the kind of leadership that will allow our unions to serve the role they must in the months and years to come. What do you think? What is the role our unions should play in the months to come? How can we make sure they do this?